John Sibley arrived in America in 1629 from Dorsetshire, England and settled in Salem, Massachusetts. Some of his more engaging descendants’ stories, that have significant connections to Detroit and to Solomon and Sarah Sibley, are included here. Judge Solomon Sibley was the 6th generation of lineal descendant from John Sibley. 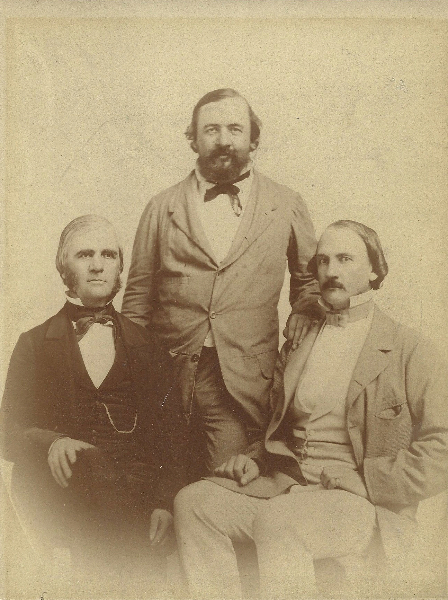 Three of Judge Solomon and Sarah Sibley's sons, L to R: Colonel Ebenezer Sproat Sibley, General Henry Hastings Sibley (1st Governor of Minnesota 1858), Major Alexander Hamilton Sibley. Colonel Ebenezer Sproat Sibley, the oldest son of Judge Solomon and Sarah Whipple Sproat Sibley, continued the family’s influential line. He was born in Marietta, Ohio in 1805 and lived both in Detroit and Marietta. He entered the U.S. Military Academy at West Point, New York and graduated first in his class in 1827. Charlotte Hart Saxton was Ebenezer’s third wife who he married on April 12, 1850. Captain Sibley and his wife, Charlotte, traveled by wagon train with six hundred army recruits from Independence, Missouri to Santa Fe, New Mexico to help establish Fort Union, a necessity because of the escalating Native American raids. Charlotte gave birth to two sons while in New Mexico, Frederick Trowbridge Sibley and Henry Saxton Sibley. Colonel Sibley’s outstanding qualities as an officer, eventually, earned him an appointment to army headquarters in Washington, D.C. Regrettably, the excessive strains of his duties forced him to retire from the service at the relatively young age of 59. He returned to Detroit, always preferring to live in hotels or with relatives. He died in Detroit on August 14, 1884 in his 79th year. 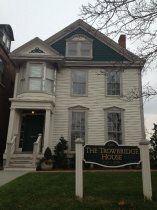 Home of Mr. Charles Christopher Trowbridge and the former Catherine Whipple Sibley, still stands on Jefferson Ave. in Detroit. Catherine Whipple Sibley, born in 1809, was Solomon and Sarah’s oldest daughter, and at the young age of fifteen, became engaged to Charles Christopher Trowbridge who already had made a name for himself in Detroit’s financial circles. The couple were married in 1826 and lived their entire lives in the home they built on Jefferson Avenue. That home, today, is privately owned. Charles Christopher Trowbridge is also properly credited with the founding of Christ Church, Detroit on E. Jefferson Avenue in 1845. The first home of the church was a small wooden building erected at the same location as the current church. The cornerstone for the present structure was laid in 1860, and the Gothic-inspired church was dedicated on June 9, 1861. The histories of Christ Church, Detroit and the Sibley House, as neighbors, partners and friends, have intertwined for over 160 years. Home of General and Mrs. Henry Hastings Sibley, Mendota Minnesota, built in 1835. Picture from the 100th D.A.R. anniversary pamphlet of the Sibley homestead. Henry Hastings Sibley, the second oldest son of Solomon and Sarah Sibley was born on February 20, 1811 in Detroit. Henry was elected the first Governor of Minnesota in 1858 when Minnesota was admitted to the union, but his start in life was certainly an auspicious one. During the War of 1812, mothers and children retreated inside Fort Detroit for safety. Sarah, Henry’s mother, swaddled year-old Henry in her arms as she determinedly made gun cartridges for the soldiers. He was known throughout his adult life as a staunch friend and advisor to the local Native Americans, particularly the Dakotas, one whom they could trust. He was instrumental in making sure that the Dakota word for “sky-tinted-water,” or Minnesota, be kept as the name of the state. Minnesota’s state seal was also suggested by Sibley – a man plowing eastward and a Native American riding on horseback toward the west. He died at home in St. Paul on February 18, 1891 at the age of 80. Daughters of the American Revolution (D.A.R.) 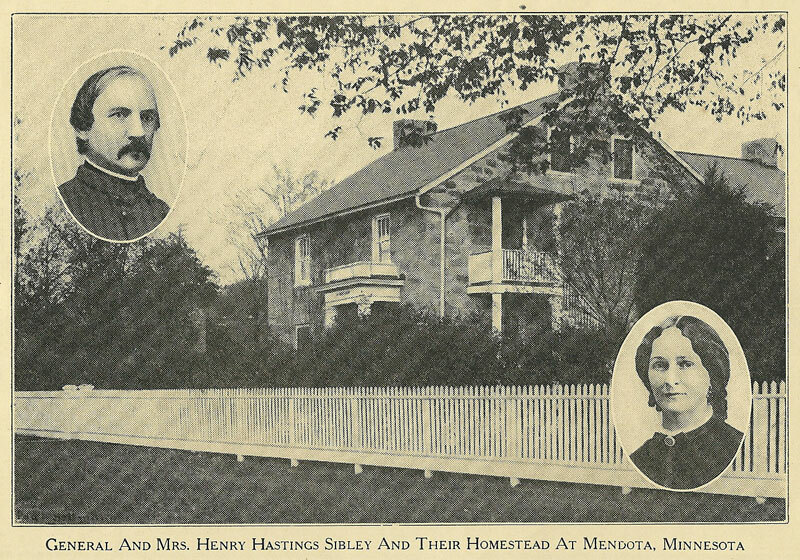 chapters throughout Minnesota restored the Henry Hastings Sibley home in Mendota, and turned it over to the Minnesota Historical Society in 1997. 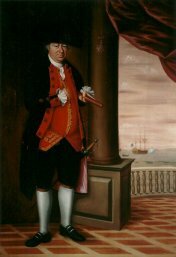 Colonel Ebenezer Sproat was an officer in the Continental Army. 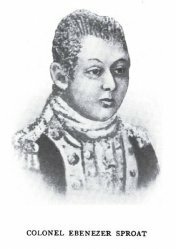 Colonel Sproat was born in Middleborough, Massachusetts on February 9, 1752. He was an officer of the Continental Army during the American Revolution and served throughout the entire campaign of the war. He was also a founder of Marietta, Ohio in 1788, having received a land grant from the U.S. government as payment for his distinguished military service to our country during our war of independence from England. Colonel Ebenezer Sproat, according to some historians, is why the state of Ohio is called the “buckeye” state. According to the legend, Colonel Sproat had a dignified and commanding physical presence. He so impressed the local Native Americans that they referred to him in their language as “Hetuck” or “big buckeye.” In his appointment as the first sheriff of the Northwest Territory, he exhibited great kindness and often gave money to the poor so they could satisfy their debts. He died in Marietta, Ohio, in 1805, and is buried in that city’s Mound Cemetery. 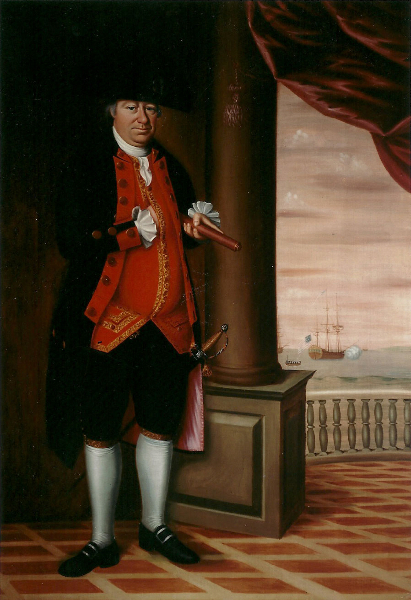 Commodore Abraham Whipple painting by Edward Savage signed and dated 1786.
schooner and outwitting a heavily guarded British fleet of 150 richly-laden merchant ships, capturing 10 of them. His efforts from that siege netted over 1 million dollars of stolen goods! After the Revolution, he was issued a land grant, and along with Colonel Ebenezer Sproat, founded Marietta, Ohio. He died in Marietta in 1819; he was 86. 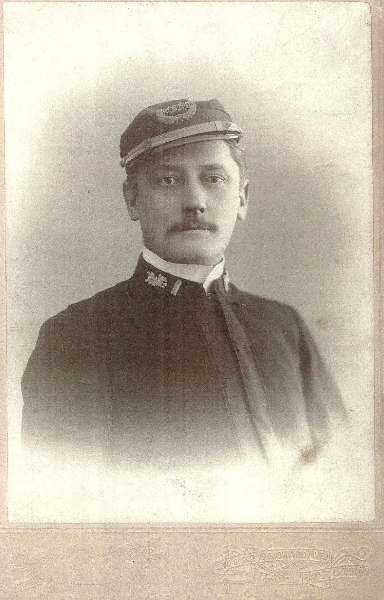 Frederick Trowbridge Sibley was the oldest son of Colonel Ebenezer Sproat Sibley and Charlotte Hart Saxton. He was born while his father was stationed at Fort Union, New Mexico on March 15, 1852. Sadly, his mother died when he was only five years old. After her death, Frederick and his younger brother, Henry, along with their father, returned to Detroit. Frederick never really had a place to call home as his father was always moving from place to place, fulfilling his military duties. As a young man, Frederick was sent away to boarding school in New York, and later, he attended law school. On April 12, 1877, he took as his young bride, Frances Eliza Campau, and to this union six daughters were born. From 1878 to 1887, with his family growing, he practiced law, as a partner, with Miller, Bissell and Sibley – forerunner of today’s firm, Miller Canfield. Allegedly, sometime in 1904 or 1905, he was involved in some financial scandal and was forced to leave Detroit, his family and move to California. He died, penniless, in a Riverside, California hospital from tuberculosis on November 16, 1916 at the age of 64. Elsie Throop Sibley was an extraordinary and accomplished woman. Born on January 20, 1878, she was the first of six Sibley sisters. 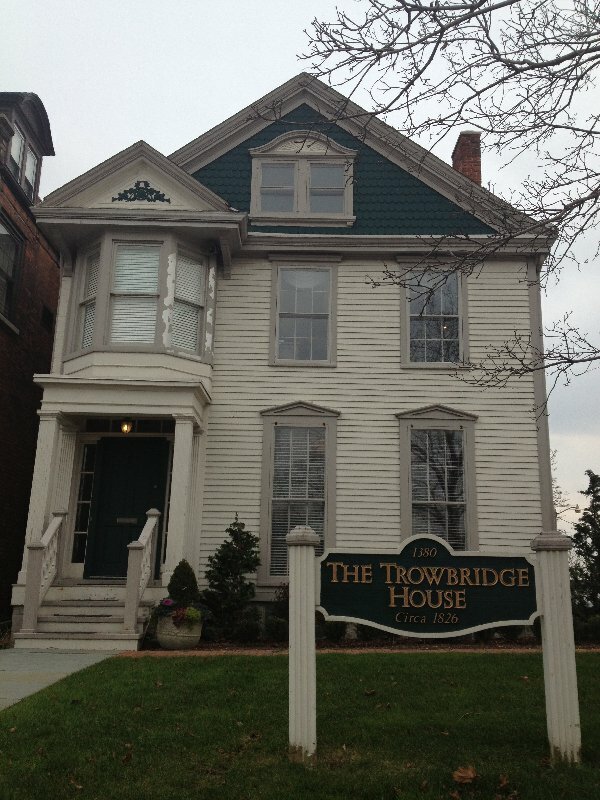 Her parents, Frederick Trowbridge Sibley and Frances Eliza Campau, married in 1877, bringing together two of Detroit’s prominent and influential families. Elsie’s life took an anguishing turn when her father mysteriously left Detroit either in 1904 or possibly, 1905. She would never see him again. Elsie, her mother, Frances, and five younger sisters remained living, as they had been, with the elder Campaus, ruled by the patriarch, Alexander Macomb Campau, well-known for his dictatorial behavior. Elsie was determined to go to college, and in 1899, she entered Cornell University (Ithaca, NY) as a member of the first class that admitted woman. Today, there is the Hiram Sibley Hall, College of Architecture, Art and Planning on campus. Funds for the original 1870 Sibley Hall were provided by a Sibley relative of Elsie’s. She obtained her journalism degree from Cornell and went to work for The Detroit Times, which later evolved into The Detroit News. While working there, she met and married a fellow journalist, Horace Baxter Peabody, in 1905. Elsie Throop Sibley Peabody died of a brain tumor on September 1, 1943; she was only 65.